Bord Failte approved, stylish apartments, conveniently located. Separate living rooms: when the children are asleep, you can enjoy the rest of your evening with a glass of wine or a freshly made cup of tea. Stress free mealtimes: Fully equipped kitchens allow the flexibility of cooking up an easy breakfast or preparing a packed lunch before heading out to explore all that Leitrim’s Hidden Heartlands has to offer. You might prefer to visit one of the many family friendly restaurants in Carrick on Shannon and surrounding areas – you will find something for everyone's palate and budget. Apartment convenience: From warming baby bottles in the microwave to putting on a quick wash, cooking a meal or enjoying a take-away; you have all the freedom/comforts of home in our Well-appointed, centrally located apartments. Check in any week day from 2pm to 5pm daily. Later check in times can be arranged with our concierge service. Explore the heartlands of Ireland’s natural beauty, where you can escape and enjoy activities and relaxation in beautifully untouched parts of the country. 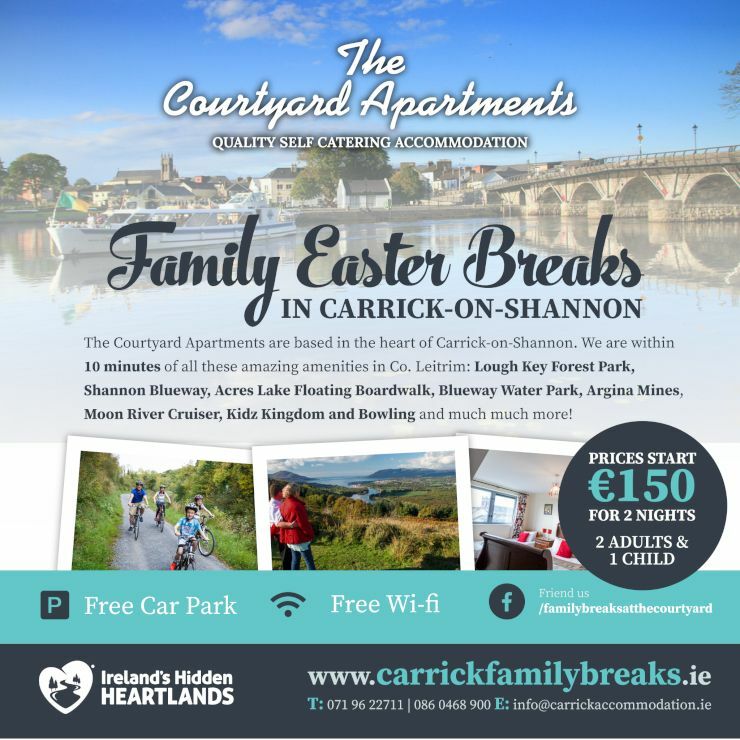 The Hidden Heartlands lifestyle can be discovered across work of land and water trails, showcased by the iconic River Shannon and the Beara Breifne Way.